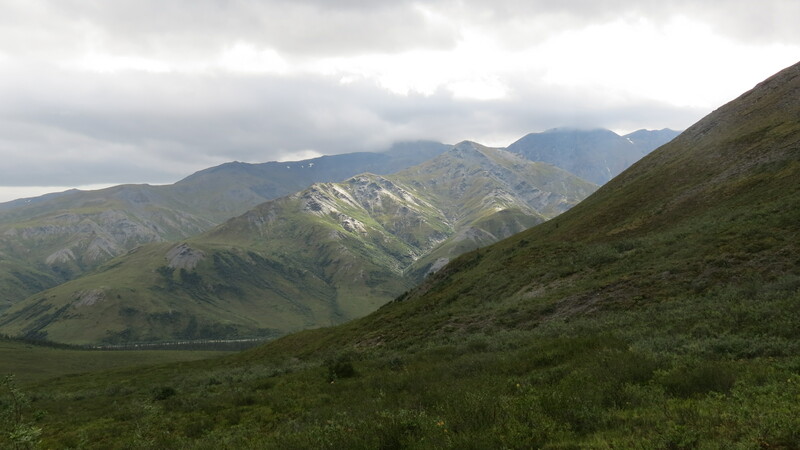 I’ve been fortunate enough to have had six extended backpack trips to Alaska, two on the Chilkoot Trail, two in the Gates (Arrigetch and Noatak River), and two in ANWR (Kongakut and Aichilik Drainages). I had missed seeing the actual Gates of the Arctic, the mountains that Bob Marshall called the Gates–Boreal and Frigid Crags. I wouldn’t see them by foot, but I could see the area near them by foot and see the Gates by air. It wasn’t quite what I wanted, but it was as good as I was going to get, and I jumped at the opportunity. Aaron and Dave guided the Aichilik trip, and Aaron is both good and strong. He now works for Alyeska, and he had time for a trip in the summer. 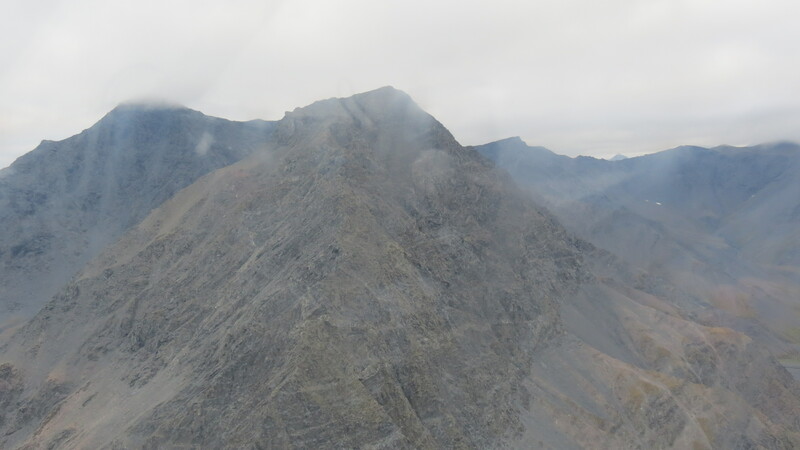 We could cut costs if we drove the Haul Road just south of Atigan Pass and hiked in, flying out. Aaron thought he could get somebody to drive his truck back home, and it was my job to pay for the flights necessary to get us from the middle of the Gates back to Bettles and then to Fairbanks. 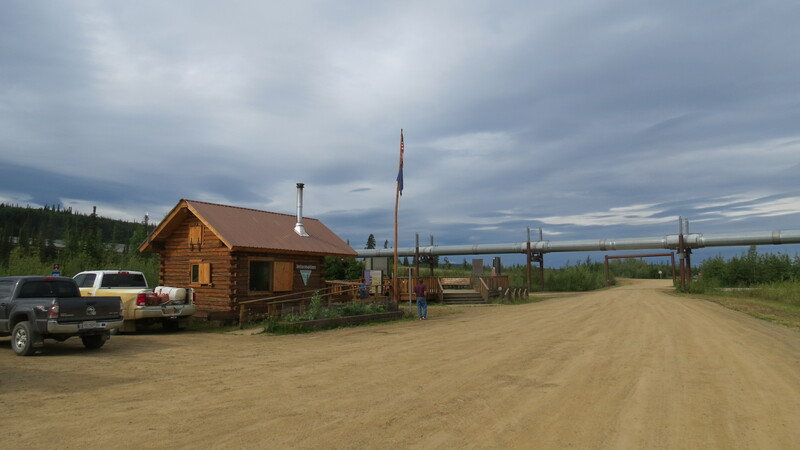 With remarkably little, but effective communication, we set up the trip, and I shaved a day off the front end by flying to Fairbanks in a day and spending overnight only before pickup at the motel the next day. 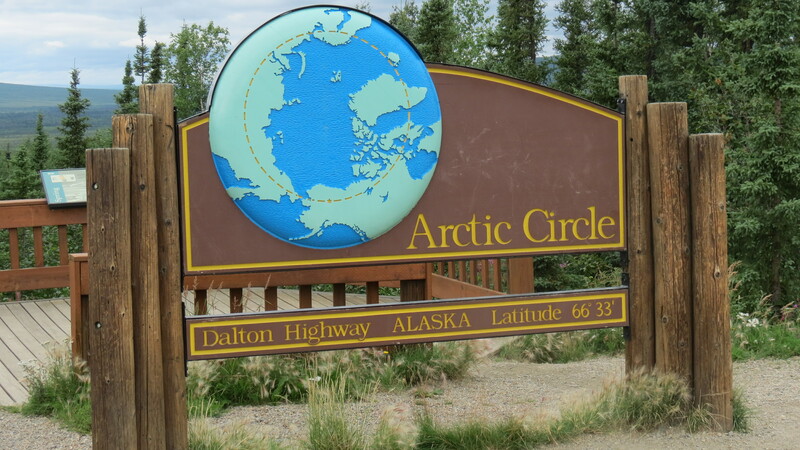 I was picked up by Aaron and his father-in-law, and we drove up the Dalton, stopping at the Yukon River Crossing for lunch, and the Arctic Circle. Aaron at base of climb. This was only about 1/5th of the entire hill. t of climbing. We decided to do it, and sent the truck back down the Dalton and camped on a sandbar in the middle of the river. The next day, sunny, we hiked through some brush, through the river, and reached the climb. It first looked easy–steep, but only about 200 feet vertical. Unfortunately, that was the first of several false summits. We would climb 1000 feet altogether, and while the grade lessened, it was steep the whole way. Aaron was carrying 93 pounds, I was carrying about 70. We camped about 2/3 s of the way up to the top, where there was some running water. We had a great view of the road, and a shorter 400 feet vertical to cross the pass. The next morning, we waited for the fog to burn off, which it did, and set off, over the pass down the other side into a large meadow and truly in the Gates. We hiked downhill about a mile and a half to the river, where I crossed a moraine briefly hyperextending my knee. While it did not appear to be a problem, I did notice some posterior pain. We had lunch, I noted no stiffness, and we continued upstream, finding a camp on a bluff above the river. 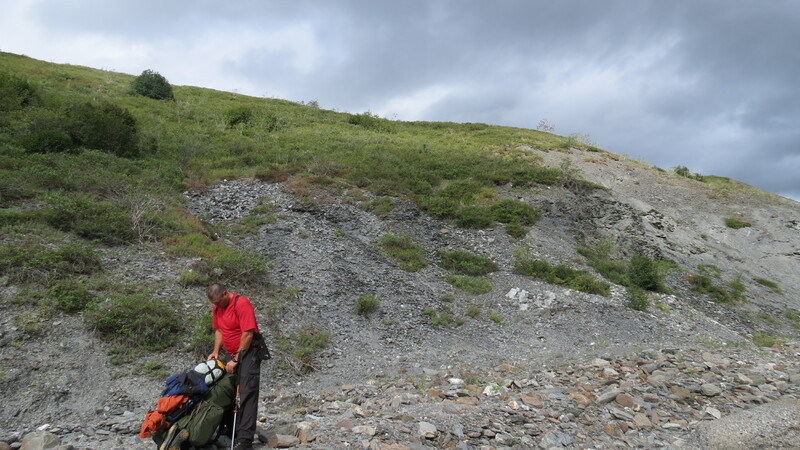 The next morning, with no more stiffness, except with full flexion, we continued upstream, the weather deteriorating. 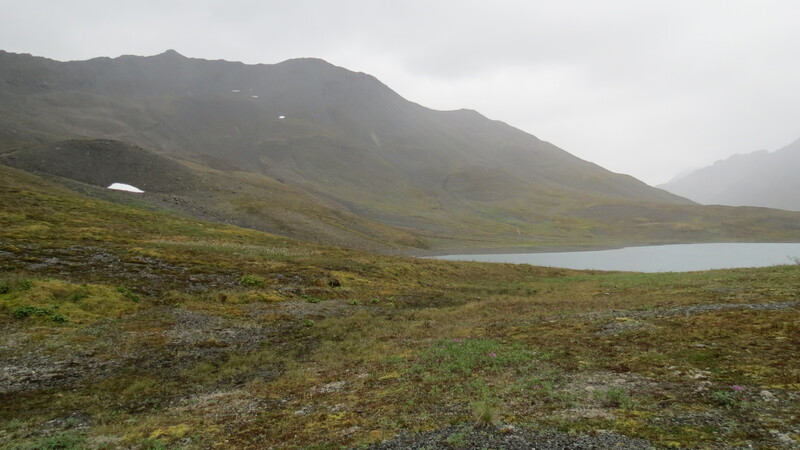 We crossed Oolah Pass, a 1000 foot climb, and saw Oolah Lake, a small pond, at the summit. 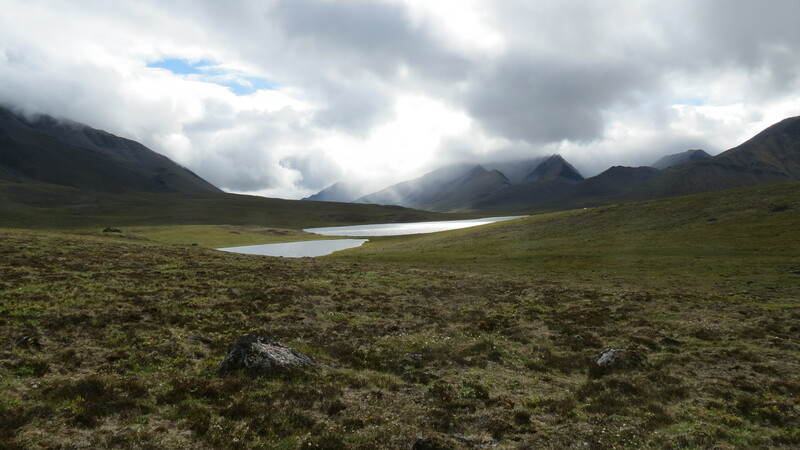 By now, we had rain and wind, the latter behind us, and we headed downstream, through several rock fields. In retrospect, we should have stayed on the other side, and high, but we stayed low, along the river, and went through some ballet-type maneuvers to get through the rocks, Quite wet, we set up camp on a bluff, where running water was available, away from the river, well below us. That night, it rained, and I got about as wet as I ever have in my tent. What I thought was poor waterproofing was instead the wind blowing the rain under the fly and through the vents. I rocked down the fly and sponged out the tent, realizing that having a tent sponge was a very useful item. We were visited by a solo hiker going the other direction. 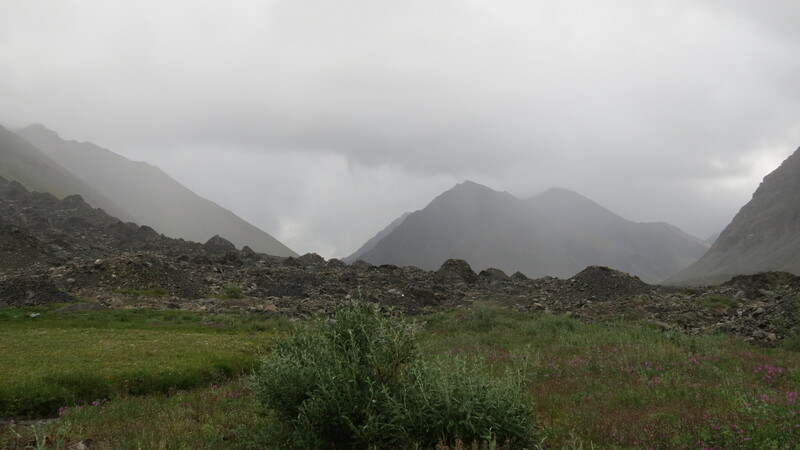 The weather no worse (and no better) the next day, we kept going, downstream and then joining the Itkillik River, crossing a giant moraine and walking through the river, tussocks, and general Alaska hiking. 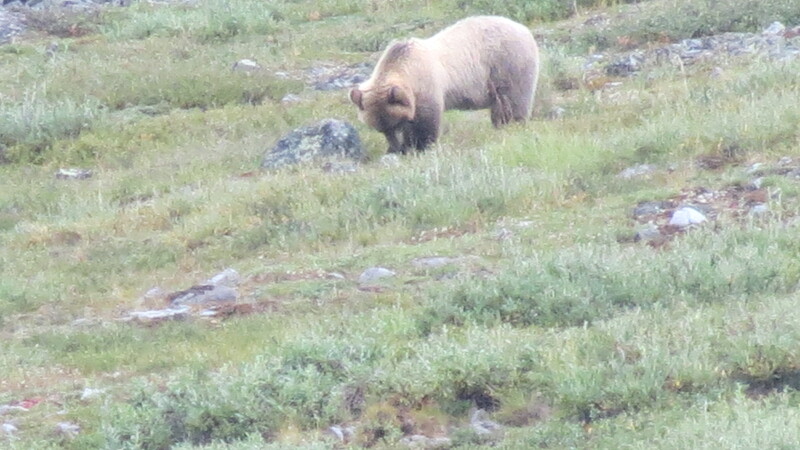 We saw a bear eating blueberries, and stayed well below him, getting pictures from a distance. I found that 35 x has some advantages. My leg was fine, and we planned on camping near the last turn that would lead a few miles to Summit Lake. I was ready to set down, when Aaron suggested a small hill about a quarter mile inland. 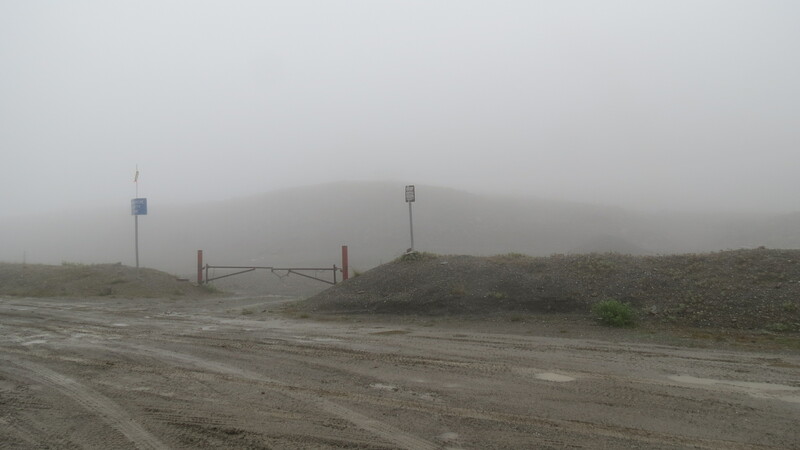 Unfortunately, the hill was covered with Arctic Ground Squirrel holes, usually meaning trouble. He then pointed to a large hill at the corner, asking “Do you have that in you?” After a whole day, I thought I did, and climbed a few hundred feet in a half mile. Neither of us was fast, but while windy, the campsite was better. From this time on, the wind was in our faces and in our lives. We were well above the river and thought we could stay high and avoid a lot of the muck. That did not work, although we did have 1-2 miles of river that had easy walking, before the vegetation a half mile on either side was swampy. We bit the bullet, crossed the swamp, and climbed a couple of hundred feet. As we crested the hill, I thought if Summit Lake was way in the distance, I would be really discouraged. It was right in front of us. NPS was camped at the best spot, but we camped across from them and had 2 days of high winds, rock down the fly, and try to stay warm. We did, although the wind was strong. 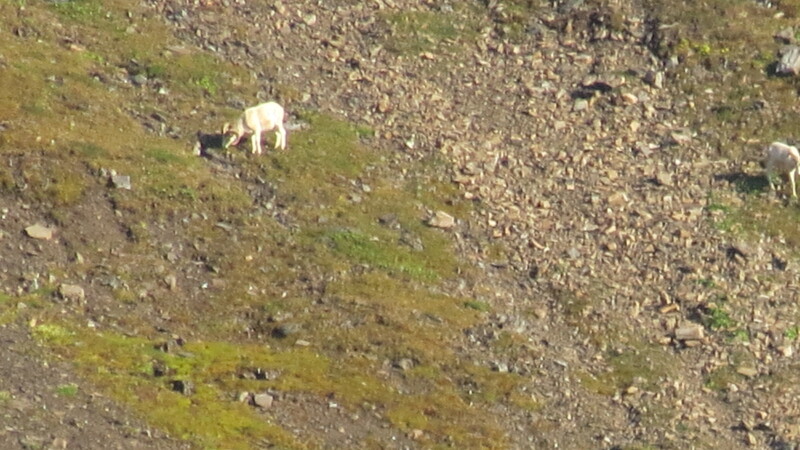 We saw several Dall sheep across the swamp high up on a mountain. Neither of us was eager to do a day hike, given the near constant probability of rain. One morning, it was calm, the tent stopped flapping, and I went outside to find us enveloped in thick fog. When I heard tent flapping a few hours later, I opened the tent door, and there was no more fog. After two nights, we were talking after dinner on the third night, and I was just about ready to get undressed to get into the sleeping bag. Aaron called his wife on the Sat Phone, and she said, “Have you heard? A plane is coming for you tonight.” Well, no, we hadn’t heard, since Sat Phones are turned off and the battery removed when not in use to save power. We quickly packed up and were almost ready when Tyler, Chief Pilot at Bettles Air, landed a Beaver on the lake. Within 1 hour, we went from getting ready for bed to being high over the Koyukuk, headed through the Gates of the Arctic, which I finally saw, back to Bettles, and another wait before we could get back to Anchorage. My knee did fine, but my leg developed soreness and swelling. My best guess is that I tore something posteriorly in the joint, perhaps a tendon, and have some blood dissecting in the muscle. What concerns me is a deep venous thrombosis as well, so ending the trip when we did gave me a chance to come home early. Was this my last backpack trip to Alaska? I don’t know. A 71 year-old did the Arrigetch, but on the other hand there are no major trips I can see myself easily doing in the Gates that I want to. There are places to go, passes to climb, but they are difficult, and some end up at Summit Lake, which I don’t think I want to see. ANWR? 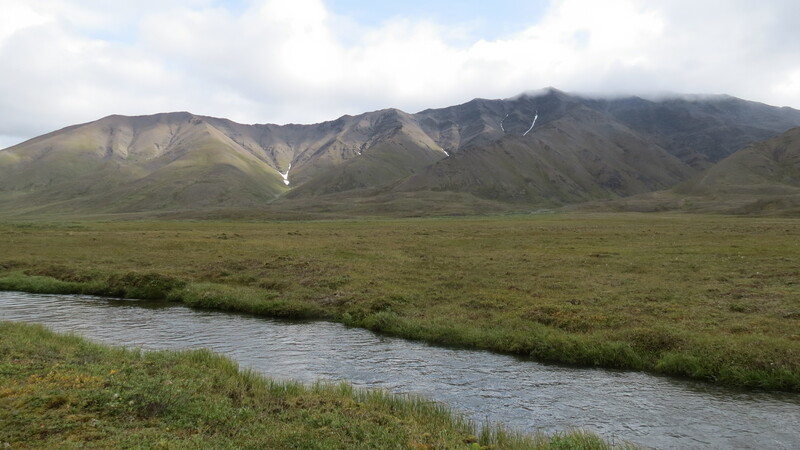 There is the Colleen, the Leffingwell Fork of the Aichilik, and the Sheenjek Drainage, the latter I have spent a night at. 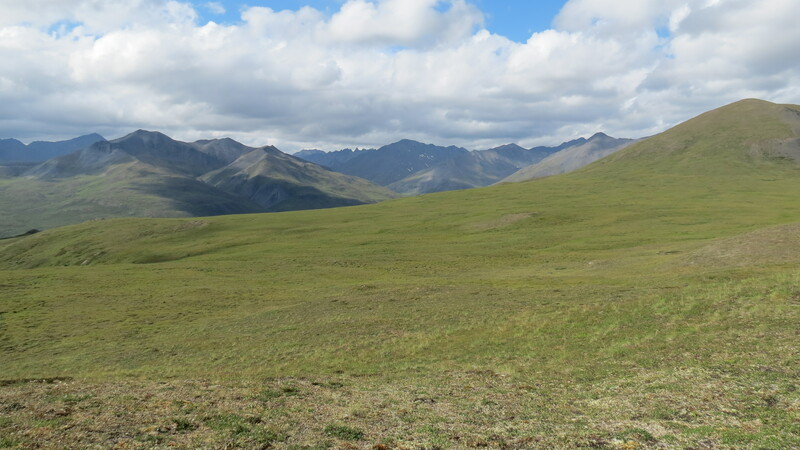 It is two flights to ANWR, one to Arctic Village, and a second into the Refuge itself. I’m not sure, but I don’t have to decide tonight….at the Anchorage Airport, waiting for a flight south. I’ll have to see what happens as I age a bit more. I think both Aaron and I think we needed to get into better shape, even though I was carrying 65 pounds every other day 2 miles for several weeks. I needed to carry more….and further. Or eat a lot less. 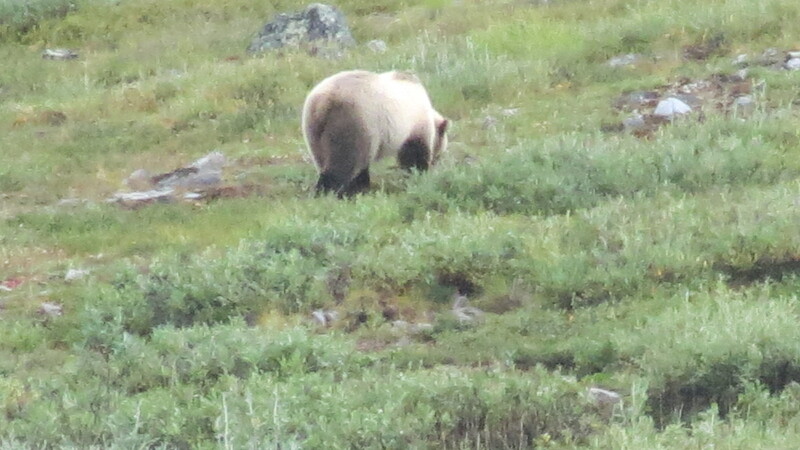 This entry was posted on August 7, 2012 at 23:52 and is filed under ALASKA TRIPS, GATES OF THE ARCTIC NP. You can follow any responses to this entry through the RSS 2.0 feed. You can leave a response, or trackback from your own site.